CAMBRIDGE, Massachusetts, USA – Saturday, March 24, 2018 – The Free Software Foundation (FSF) today announced the winners of the 2017 Free Software Awards at a ceremony held during the LibrePlanet 2018 conference at the Massachusetts Institute of Technology (MIT). FSF president Richard M. Stallman presented the Award for Projects of Social Benefit and the Award for the Advancement of Free Software. This year, Public Lab received the award, which was accepted by Liz Barry, Public Lab co-founder, organizer, and director of community development, and Jeff Warren, Public Lab co-founder and research director, on behalf of the entire Public Lab community. Public Lab is a community and non-profit organization with the goal of democratizing science to address environmental issues. Their community-created tools and techniques utilize free software and low-cost devices to enable people at any level of technical skill to investigate environmental concerns. Stallman noted how crucial Public Lab's work is to the global community, and also how their use of free software is crucial to their mission, saying that "the environmental and social problems caused by global heating are so large that they cannot rationally be denied. When studies concerning the causes and the effects of global heating, or the environmental impact of pollution, industry, and policy choices, are conducted using proprietary software, that is a gratuitous obstacle to replicating them. "Public Lab gets the tools to study and protect the world into the hands of everyone -- and since they are free (libre) software, they respect both the people who use them, and the community that depends on the results." Jeff Warren, speaking on behalf of the Public Lab community, added that using free software is part of their larger mission to take science out of the hands of the experts and allow everyday people to participate: "At Public Lab, we believe that generating knowledge is a powerful thing. We aim to open research from the exclusive hands of scientific experts. By doing so, communities facing environmental justice issues are able to own the science and advocate for the changes they want to see. "Building free software, hardware, and open data is fundamental to our work in the Public Lab community, as we see it as a key part of our commitment to equity in addressing environmental injustice." The Award for the Advancement of Free Software goes to an individual who has made a great contribution to the progress and development of free software, through activities that accord with the spirit of free software. 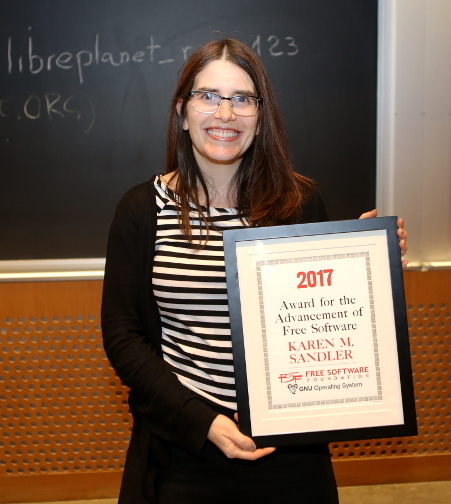 This year, it was presented to Karen Sandler, the Executive Director of the Software Freedom Conservancy, as well as a perennial LibrePlanet speaker and friend to the FSF. She is known for her advocacy for free software, particularly in relation to the software on medical devices: she led an initiative advocating for free software on implantable medical devices after exploring the issues surrounding the software on her own implanted medical device (a defibrillator), which regulates an inherited heart condition. Sandler has served as the Executive Director of the GNOME Foundation, where she now serves on the Board of Directors, and before that, she was General Counsel of the Software Freedom Law Center. Finally, she co-organizes Outreachy, the award-winning outreach program that organizes paid internships in free software for people who are typically underrepresented in these projects. Stallman praised Sandler's dedication to free software, emphasizing how sharing her personal experience has provided a window into the importance of free software for a broader audience: "Her vivid warning about backdoored nonfree software in implanted medical devices has brought the issue home to people who never wrote a line of code. "Her efforts, usually not in the public eye, to provide pro bono legal advice to free software organizations and to organize infrastructure for free software projects and copyleft defense, have been equally helpful." Sandler explained that her dedication to promoting free software was inevitable, given her personal experience: "Coming to terms with a dangerous heart condition should never have cost me fundamental control over the technology that my life relies on," she said. "The twists and turns of my own life, including my professional work at Conservancy, led me to understand how software freedom is essential to society. This issue is personal not just for me but for anyone who relies on software, and today that means every single person."